Get it for Amazon Kindle! Political fundraising enters the twilight zone. 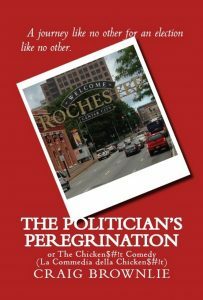 What happens when a political operative faces a city on the edge? Are there worse things than asking Odin for a campaign contribution? Lyndon Johnson said that it only takes one night for chicken excrement to turn into chicken salad in politics. Political hack Cyril Brand learns that the process also works in reverse in a single night in Rochester, New York. Cyril is the forward man for Senator Blackheath, 2008 presidential candidate. As the book opens, he is in Rochester, New York, to organize a fundraising dinner for the Senator. He steps out of the convention hall to grab a quick lunch only to embark on an odyssey through the highlights and lowlights of the city.